Isn't Fred the cutest tukei gecko ever?? Except he's a SHE! LOL! Just saw her little ones yesterday, they're feisty like mommy! Fred is about 6inches around her tummy, 10inches long to the end of her tail. She's been a regular at our place for years. Or should I say, WE've been regulars at HER place for years LOL! Nice! 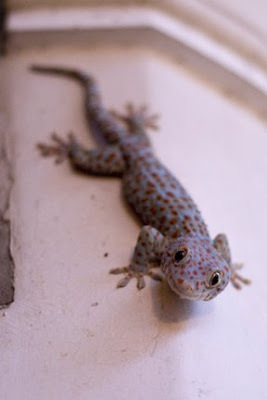 I have a little gecko who lives under my microwave. His name is Bob. I hope he doesn't get any radiation from the microwave or I might have to start calling him "Bob, sir."